Web Database Application Templates built with Bootstrap, ASP, MS Access. Download & customize using Dreamweaver. 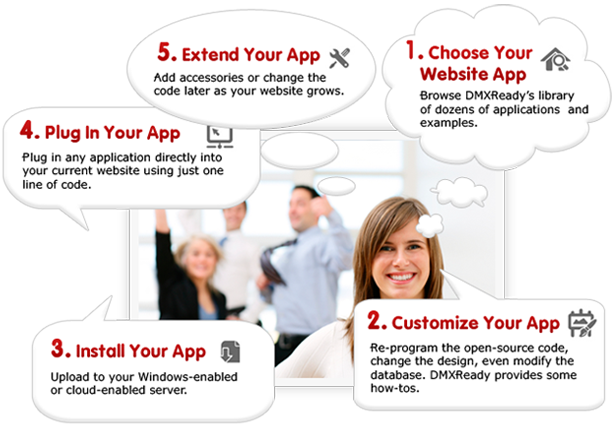 DMXReady web application templates help web designers and do-it-yourselfers build database-driven CMS websites and custom web applications. Search our library of cms website templates, web application templates and asp scripts to find the product that fits your project best. Remember, every product is a working "template" that is 100% fully customizable so you can enhance, restore, recycle, re-purpose etc. into your own personalized solution. Easy to install, easy to use, and less headaches than developing from scratch. Browse our catalog of classic asp website plugins that can instantly enhance any windows hosted website. Create Your Own Killer Web Apps By Modifying Ours! All applications are "Ready to Go" right out of the box so you can just upload and install. Or customize your application right down to the code level to make it uniquely your own. You + DMXReady = Great Websites! Installs in Minutes: Unzip and upload to your windows host/server. Template File Architecture: Edit the template files using Dreamweaver or any HTML editor. Fully Customizable: Enhance with your own html5, jquery, ajax, css3, Bootstrap etc. Plugin Ready: Add to your existing website or use as a standalone web app. Web Database Included: Includes MS Access database (MySQL & MSSQL ready). Windows Host/Server: Can run on all windows servers/hosts that support ASP . White-Label Your Creation: Enhance, restore, recycle, repurpose, resell etc. as you wish. Full Refund Policy: If the software does not meet your needs, return it for a full refund. No Monthly Fees: Stop paying to use someone elses software, invest in your own.